This is technically a week late in coming, but I was so caught up in Retro X-aminations that I totally forgot to do this post for February, so better late than never! Here's what's coming up this month, as we dive into "X-Cutioner's Song" and Excalibur goes bi-weekly for some reason! 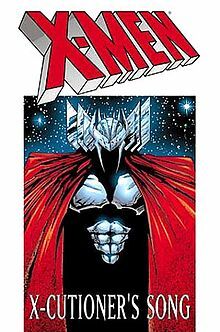 Can I just say how much it bothered me as a subscriber to all the X-Men books at the time through Marvel's back of the magazine subscription that they did not include the Cards with this crossover in any of the books. I had to then go and buy the book from a local store in order to get the card. They really screwed us 11 year olds over at the time when getting a car ride for a store 30 miles away was a bit tough just to get a card that should have come with my subscription. Oh man, that blows that they wouldn't send you the polybagged version. Seems like the least they could have done for subscribers. My neighborhood bookstore (I miss those) had each issue on its racks in bag with card. I vividly remember walking down each week to get the next issue and the older lady who worked behind the counter would sometimes give me a little toy, too. That's where I got X-Men #1 and Amazing Spider-Man #349, my first ever issues of both comics. It was a great introduction. Amazing #349 was my first too! I didn't understand any of the context, but I still loved it.